APGENCO Junior Accounts Officers(JAO) Recruitment Hall tickets 2018/ APGENCO Trainee Junior Accounts Officers(JAO) Recruitment Results/APGenco JAO Recruitment Online application form/APGENCO Recruitment 2017/APGENCO JAOs recruitment 2017, Results/Merit List/APGenco JAO Recruitment Hall tickets, Results 2017/ APGenco JAO Recruitment Results 2017 APGENCO Trainee Junior Accounts Officers(JAO) Recruitment Selection list Results 2017: APGENCO has releaseed the Trainee Junior Accounts Officers(JAO) Recruitment 2017 Notification and AP State Power Generation Corporation Limited (APGENCO) invites the #onlineapplications from the eligible and qualified candidates for the post of Trainee Junior Accounts Officers(JAO). 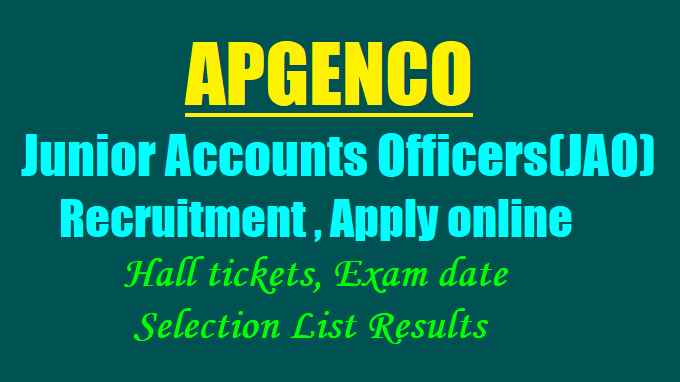 APGENCO Junior Accounts Officers(JAO) Results 2018: AP GENCO Trainee Junior Account Officer Provisionally Selected List. AP GENCO Trainee Junior Account Officer Provisionally Eliminated List. List of Revised Provisional Selection for the post of Trainee Junior Accounts Officer vide Notification No.01/JS(Per1/2017, Dated: 10.11.2017. The list of 25 provisionally selected candidates for the post of Trainee Junior Accounts Officer placed. in APGENCO websile on 26.06.2018. During the Course of verification of testimonials of the provisionally selected candidates, certain candidates could not produce the documentary evidence in support of the details furnished in online application 85 OMR sheet. As a result they got eliminated from the selection process and certain provisionally selected candidates have not attended to the original certificate verification. The list of candidates who fallen in the zone of consideration consequent to re-drawal of the list is as detailed in pdf file. They are requested to attend for the verification of Original documents on 28.12.2018 at 11:00 A.M g Vidyut Soudha, Gunadala, Vijayawada. Letter of communication to the above effect will be sent to the e-mail id given in online application. Step 4: Download JAO Results and Search for your name OR Hall ticket no. Trainee Junior Accounts Officer: The candidate should possess the following qualifications as on 01.10.2017. SC,ST, BC and Physically challenged (having disability of more than 40% and above in respect of VH, OH and more than 75% for HH )Rs. 150 / - towards application registration fee. N.B. Mere securing minimum qualifying marks does not vest any right to a candidate for selection to the post of Trainee Junior Accounts Officer. The said preferences are only indicative for being considered to the extent possible but no binding. Therefore, the APGENCO has the power to assign a successful candidate to any notified post in the zone in respect of non-local candidates, for which, he/ she is considered to be qualified and eligible, subject to fulfilling the selection criteria. Mere claim of preference for any zone for allotment against vacancy does not confer any right to selection for that Zone in particular or any Zone in general. F) Candidates have to produce original documents viz. Date of Birth Certificate, Educational Qualification certificate/s, community certificate, physical disability certificate (disability not less than 40% pertaining to VH and OH and 75% in respect of HH) issued by the concerned competent Medical Board Viz:, VH - Regional Eye Hospital, Visakhapatnam, HH -Govt ENT Hospital, Visakhapatnam OH - King George Hospital, Visakhapatnam, if any, study/ residence certificate and other particulars for verification as and when required and called for. If the particulars furnished in the Online Application Form do not tally with the original documents produced by the Candidates, his/her candidature will be rejected. The candidate has to apply online through APPLY ON LINE link at www.apgenco.gov.in or directly through http://apgenco.cgg.gov.in link after carefully going through the instructions mentioned therein.